In Fall 2019, a Family Faith Formation option will be added to our regular Parish School of Religion catechism classes. 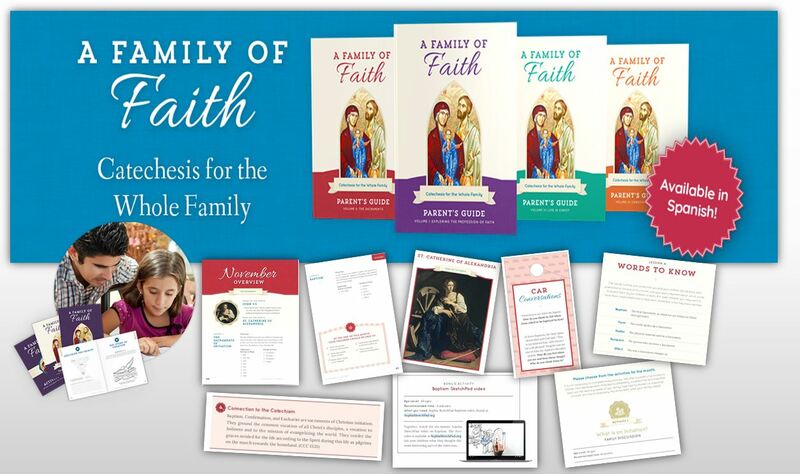 ​Our curriculum is the ground-breaking Family of Faith program from Sophia Institute Press. Families meet once a month for a parental retreat and youth/children activities. After some food and fellowship, parents / guardians are taught that month's subject by some of the parishes best catechists. These lessons prepare them to share each week with the rest of the family. Program activities involve the whole family at any level so no one need be left out. After the retreat, we can go to mass as one community. The program's flexibility is only one of many benefits - the primary ones being the "catechetical culture" we hope to bring back to the home where it is most fitting. Another benefit is that after the program's four-year cycle (following the four "pillars' of the Catechism), the program repeats. This allows the faith to be reinforced for repeat students as they learn this important material at a higher level. It is also available bilingually! For more information feel free to contact the parish Director of Religious Education. The numbers are in, and they are not good. According to various studies, the Church is losing a large amount of members annually. One report stated that 3,500 people leave the Church every day. Many parishes aren’t even that big! What is perhaps more shocking than the total is the timeline. About 80% are walking away from their faith by the time they reach college age. The median age, however, is 13 years old. That alone should make us pause, especially when we realize that if the fruit of apostasy is ripening in the tween years, its seed started growing in childhood. ​Catholics often blame many of the Church's woes - including this one - on poor catechesis. Although the quality level of various catechetical programs certainly varies from parish to parish, here's a reality check: Regular Mass attendance plus the typical weekly catechism class equals barely 1% of a person's life. That means that even during the school season, 99% of a child's experience is outside of parish catechesis. No matter how good a program is, classroom catechesis only works in the context of a faithful community. One percent of a child’s life can’t overcome the other ninety-nine. When faith formation is limited to the classroom, its impact is not only lessened - it can make the faith appear useless. In that case, catechesis becomes just another hoop to jump through to get those sacraments checked off. For some reason. It produces a "faith" that is easily dismissed once all the boxes have been checked. Of course this is never the goal of families participating in parish religious education - but the classroom catechesis model can unfortunately foster a "school mentality" where instead of supporting parents, the parish ends up supplanting them. It becomes solely the parish's – not the parent’s - job to catechize the children. And when this fails, “poor catechesis” gets the blame. ​The Church’s expectation that parents act as catechists to their children might sound frightening or radical - but it really is a simple reflection of everyday reality. Parents teach their children how to walk, talk, think, and behave - it's just what happens in parenting. Most often these lessons are "caught" more than they are "taught" of course - because children learn from their parents simply by being around them. The same is true of living the faith. If parents skip Mass anytime it is inconvenient, that is the lesson their children will learn about the importance of mass. If parents pray before meals, that is the life of prayer the children will learn. If parents spend time in Scripture and say a daily rosary, that is what the faith will look like to their children. The faith that children affirm (or walk away from) will be the one their parents - not their parish - teach them. ​Most parishes today operate on a “classroom” model of catechesis. That is, they treat faith formation as a subject to be learned rather than a faith to be lived. Parents leave their students in school classrooms run by teachers using textbooks to be tested for their level of preparation. Is it any wonder that many families see their child’s sacrament reception as a graduation ceremony? Family Faith Formation is a new model based on an old idea (parents as primary catechists to their children). This represents a radical role reversal in typical Catholic religious education, but it’s really just an application of the Church’s mandate to form adults so that families can catechize their young. When this occurs, children are taught the faith as a way of life and not just as a weekly class. Family Faith Formation is basically the principle of subsidiarity applied to children's catechesis. The parish’s role is one of equipping – not replacing. The focus is on giving parents tools to help them succeed at being the religious educators that they already are. For most families, high-level theological training is not as important as faithful practices, and Family Faith Formation can help with both. No single parish program can meet the particular needs of all families. No matter how perfectly planned a parish school model is, there will always be those for whom it will not work. Schedule conflicts with school, work, sports, and other extracurricular activities are sometimes impossible to fully mitigate. Family Faith Formation makes for a program flexible enough to accommodate a wider range of schedules, learning styles, and abilities. The fact is that "Primary Catechist" is an unavoidable and irreplaceable role for parents. It is one that parents have by nature - not one that is awarded by experts. The Church has made it clear that the parish's role is to support parents—not supplant them, and St. Joseph's religious education department is committed to doing so!